Harold Arthur MacGill was born on November 5, 1875 according to his World War I draft card which also had his full name. 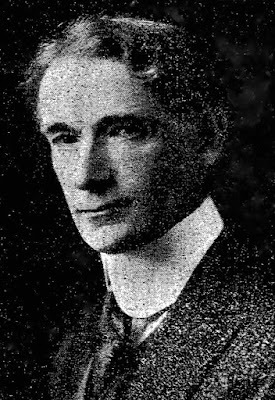 Newspaper profiles of MacGill said he was born in November 1881 in Yarmouth, Canada. The 1910 U.S. Federal Census recorded MacGill in Queens, New York at 130 Palace Boulevard. The newspaper cartoonist was married to Agnes and had a son and daughter. MacGill employed three servants. MacGill signed his world War I draft card on September 12, 1918. He resided in Bayside, Queens County, New York on Palace Boulevard. The cartoonist was employed by Frank Munsey, the publisher. MacGill was described as medium height, slender build with blue eyes and brown hair. In the 1920 census MacGill and his family lived in Flushing, Queens County, New York on Odell Avenue. MacGill was a self-employed artist. American Newspaper Comics (2012) said MacGill produced over twenty comic series. His best-known and longest-running series was The Hall-Room Boys also known as Percy and Ferdie. It ran from October 8, 1904 to April 3, 1924 with various syndicates. Percy and Ferdie was collected in a book. The syndicate provided a profile of MacGill to newspapers subscribing to Percy and Ferdie. Space limitations affected the length of the profile. Three versions were found in the Rockford Republic (Illinois), April 22, 1922, News-Dispatch (Endicott, New York), April 26, 1923, and Cortland Standard (New York), March 8, 1924. Texts from each newspaper were combined to create the following long version. This is the story of a comic cartoonist who got his start putting designs on tombstones. The professional artistic career of Harold A. MacGill began in his father’s monument plant at Yarmouth, Nova Scotia. It developed into the production of a newspaper comic strip that has the longest run in America. Percy and Ferdie, the Hall-Room Boys, have been on the newspaper stage for 18 years. It is remarkable how they have kept their youth, snap and swank, after appearing 365 times a year since they sprang to life under MacGill’s pen in a New York newspaper office long ago. They swagger through a week-day strip and full Sunday page in over a hundred newspapers, amusing with their bluff and effrontery, hundreds of thousands of readers from Maine to California, and from the Isthmus of Panama to the Arctic circle. Harold A. MacGill was born in Yarmouth of New England-Scottish parents in November, 1881. He attended Yarmouth schools, but gave more attention to caricaturing his teachers, putting wigs on the pictures of bald statesmen in the history and turning to comics the serious illustrations in the geography than he gave to his studies. He covered the backs of maps with designs of his own which pleased his fellow students but annoyed his instructors and decorated the walls of the Y.M.C.A. locker room with [illegible] which began his considerable [illegible] reputation. “When I was old enough,” he said, “my father put me to work in the monument plant. There I was supposed to draw the conventional ivy leaf and the cross and crown for the tombstones of the town’s celebrities. The fame of young MacGill got him a number of odd jobs making advertising cards, posters for the street railroad and signs for various shops. Harold also collected the usual number of rejection slips. He saved his money with the idea of going to New York to make his fortune. In 1900 he realized his ambition in coming to the city and as to whether he has made his fortune his six-cylinder car and comfortable suburban home can testify. With the parental blessing he received a $10 gold piece which is still in his possession, and fortifies his claim that he was never really “broke”. MacGill did not exactly starve in a garret at any time in his career, but when he first arrived he did spend a week in a boarding house which gave him the background for The Hall-Room Boys who live out of tin cans, cook over the gas when the landlady does not catch them and put all of their slender capital into clothes. From the boarding house he moved to a little apartment which was dignified by the name of studio. Here he and other cartoonists now famous had many a good time in the irresponsible joyousness of their impecunious youth. Like the heroes of the [Horatio] Alger books, MacGill was soon rewarded with a position and he got a newspaper job but it didn’t bring him into contact for a long time with the illustrators he yearned to meet. He became a “slip boy” in the old New York police headquarters on Mulberry st. The slip boys handled the routine police reports for the newspapers and assisted the older reporters. “I wasted several years down there,” he said, “I should have been carrying around photographs and retrieving erasers in the art room of some newspaper office. However, I went to Cooper Union for a while at night, where they tried to teach me to draw hands and feet. Finally I drew a cartoon on a subject involving the police headquarters which pleased the editor of a New York daily newspaper, and he gave me a job. I drew cartoons for a while and later worked as a reporter at $5 a week. This reporting was something I wasn’t fitted for or interested in, so I devised a series of “future punishments” which got me a job on another evening newspaper. In this series I imagined a just reward for men in various walks of life. A cab driver, for instance, would be [illegible] get between the shafts and [illegible] as passenger around streets that are paved with good intentions. “You want to know where I got the idea for the Hall-Room Boys?” he said. “Well, I got a number of suggestions from real life. As an illustration: One evening on the gay white way of the Broadway theatrical district, I saw an elegantly dressed man, in a top hat and all the accessories, with a young lady whom I knew. I was curious as to who he was, and found out that he lived in a boarding house, kept his shiny hat under the bed, timed his rising in the morning by an alarm clock, punched the time clock at a department store, and there juggled rugs in the rug department for the balance of the day. “Another young fellow who displayed the same kind of swank lived where I did. He was good looking and appeared to advantage in a dress suit. One evening he suggested that we go to the Waldorf, where there was a fashionable affair of some sort. MacGill is neither a Percy nor a Ferdie. The more he draws flashy persons the deeper becomes his dread of being like them. The features of Ferdie might be a caricature of MacGill’s, but that’s just a coincidence. The cartoonist is smooth-shaven, and does not show all his forty years. He is of medium height and by exercise has maintained a slender figure. He has a heavy shock of light hair on which time has not yet laid a finger, and he shows pride in it by wearing it a little long—but not of poetical length. The author of Percy and Ferdie is quiet in manner, deliberate in speech, unaffected and easy of approach. He has a quaint chuckle which goes well with his dry Scotch humor, but he is no more a loud-voiced back-slapper than he is glum. He would probably fail completely as a book agent. MacGill admits he is even-tempered. He claims to be the only man living who, without losing his equanimity taught his own wife how to run the car. The boys have been on the stage and are now in their third year in the movies. They appear also between book covers. Although reluctant to talk about his work, MacGill need not be urged to discuss his two beautiful children. He is exceedingly proud of them and of the fact that Mrs. MacGill is more likely to be mistaken for their sister than their mother. Laurence Leighton MacGill is 13, and will resent the word “beautiful” as applied to him. He is at present filled with the radio fever, and keeps the electric light switches in good repair. Laurence’s father was first convinced of the boy’s genius when he refilled a non-refillable bottle. While the son has embarked on a career in mechanics, his sister Vivian, a year younger, hesitates between the graphic arts and classic dancing. The MacGill home is in a suburb of New York city on Long Island, out where the lawns begin. The village in which it is situated, and which contains a considerable colony of artists, writers and actors, is in Greater New York, but is actually rural and has not yet arrived at the metropolitan dignity of street numbers. In this peace and quiet, MacGill can work without interruption and need only go into New York once a week with his drawings. If he wishes to attend the theater or shop, however, an electric train takes him to the heart of Manhattan in half an hour. The grounds of the inviting home show the cartoonist has been busy with the lawn mower and hedge clippers when he could get away from his drawing board. Other strips by MacGill are J.M. Muggsby’s Social Aspirations, The Economical Husband, and The Second Mrs. Mac. According to the 1930 census, MacGill emigrated in 1898 and made his home at 205-15 42 Avenue in Bayside, New York. He had submitted naturalization papers. MacGill’s occupation was “Cartopracter”. At some point MacGill moved his family to Manhattan. The 1940 census said the MacGill family was at 65 Seaman Avenue. MacGill was still an alien. MacGill passed away December 1, 1952, in the Bronx, New York City according to the New York, New York Death Index at Ancestry.com.